Canon Powershot SX410 and Nikon Coolpix L840 are two digital cameras that offer exceptional image quality and zooming power. However, Nikon Coolpix L840 is standing at a price point that is slightly higher than Canon Powershot SX410. So, which is the model that you should get? Canon Powershot SX410 is a digital camera with top-notch image quality and zooming power. It features the 20 MP CCD image sensor that is, coupled with the powerful Canon DIGIC 4+ image processor, able to deliver not only high-resolution images, but also full and solid colors. One great thing about the image sensor is that, compared to CMOS image sensor, CCD is able to deliver a significantly lower amount of noise, generating such an exceptional color depth. On the downside, however, it consumes a lot more power from the battery. Additionally, Canon Powershot SX410 also offers a maximum video quality of 720p HD at 25 frames per second. The digital camera also boasts an extremely powerful 24-960 mm lens, which allows for up to 40X optical zoom. Hence, Canon Powershot SX410 makes a great choice for sports and wildlife photography, in which cases you can’t get near to your photo object. Canon Powershot SX410 features a 3.0-inch LCD screen for a neat and convenient framing, and there is the ECO Mode that is very handy to extend the battery life. On the other hand, Nikon Coolpix L840 is armed with a low-light 16 MP CMOS image sensor. Even though it doesn’t have a maximum photo resolution as high as Canon Powershot SX410, it already supports 1080p Full HD video recording with stereo sound. In addition, Nikon Coolpix L840 is packed with a 4-152 mm lens with a maximum optical zoom of 38X with Vibration Reduction, and 76X Dynamic Fine Zoom. Nikon Coolpix L840 is certainly one digital camera that is packed with features; it features an autofocus technology with contrast detection already. Nikon Coolpix L840 also features a 3.0-inch tiltable display screen. Last but not least, Nikon Coolpix L840 comes with built-in Wi-Fi and NFC for easy file sharing with other devices. Take a look: Nikon Coolpix L840 vs. B500. 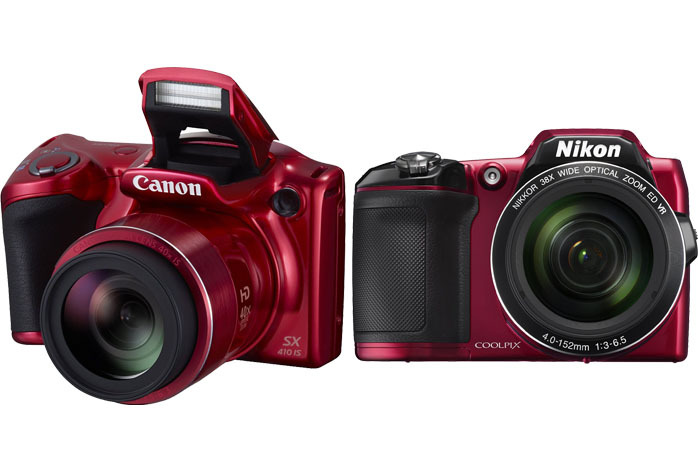 Choosing between Canon Powershot SX410 and Nikon Coolpix L840 is indeed tricky. However, for casual and general-purpose usage, Nikon Coolpix L840 makes the best way to go due to the practical additional features. Canon Powershot SX410 is viable if you don’t need the Full HD video recording and wireless connectivity.